I VISIT THE WOLF & ROSIE STUDIO TO FIND OUT MORE ABOUT ROSIE'S BEAUTIFUL HAND PAINTED LEATHERS AND MEET LEAH NICHOLLS, FOUNDER OF SLEEPING BEAUTIES, ARTISAN MADE SLEEPING BAGS. 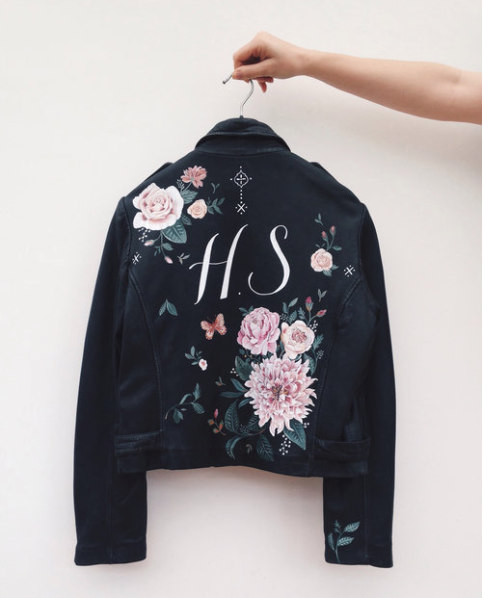 Wolf & Rosie, hand paints leather jackets to create beautiful bespoke and custom pieces, specialising in botanical designs with a touch of the bohemian. I visited Rosie Harbottle, founder of Wolf and Rosie and close friend of mine at her studio in Chudleigh, south Devon to find out a little more about a brand that has taken the fashion world and bridal market by storm. It's always a pleasure for me to sit in the beautiful bohemian space, sipping tea with Rosie, watching the chickens peck and scratch beyond the window ledge, with the dogs at our side, talking all things creative in the countryside. Here's a little of what I discovered during our chat. “I love to incorporate the brides favourite flowers into the artwork along with chosen wording. Above all, I strive to create pieces to be treasured and worn for ever,” Rosie enthuses of her creations. The story behind the name is as dreamy as the brand itself – born out of love – combining the nickname of her partner Chris - ‘Wolfy’, with her own name, presenting a juxtaposition of masculine and feminine through her tough leathers, that are hand-painted with soft, romantic, floral designs. Rosie uses specialist paints that are 100% waterproof as well as crack-proof. Each design is finished with a flexible glaze that allows for movement of the garment, enabling the design to become part of the leather itself. Wolf & Rosie designs have a distinct colour palette, made up of blushes, pinks, soft greens and blues. Although Rosie’s personal style incorporates an array of brightly coloured designs, her painted leathers are more muted, enhancing their wearability. Wolf & Rosie work on one off, bespoke custom pieces, though with the average jacket taking a week to complete, including sketching ideas and looking at the colour palettes, there are future plans for limited edition print runs, where the hand drawn designs will be printed and scanned, enabling more jackets to be made. The brand, unquestionably have a global appeal, creating customized jackets and bespoke stationary for ceremonies and events worldwide, from the magical allure of Marrakech to sunny Florida, rural Tuscany, exotic Bali, Amsterdam and the wilderness of the Nevada desert. Rosie recently took part in her first live painting event, where she hand-painted leather jackets at a two-day live event in Topshop's flagship store at Oxford Circus. The event, held in collaboration with 'Most Curious' exclusively curated wedding fair, marked the launch ofTopshop’s bridal range. The painted leathers were an instant hit. “Once again, I’ve been absolutely overwhelmed with the response and follow up requests. I think it is all down to hitting on a niche that hasn’t yet been exploited,” she says of her recent success. Entirely aware that she almost fell into the bridal market, I ask Rosie if this is an area she’d like to continue working and what the future holds for her sought after brand; “I am currently working on a collaboration with Rewritten, who are an independent bridesmaid brand.” Rosie will be producing custom bespoke designs involving floral embroidery for an established fashion blogger. Wolf & Rosie have managed to hone in on a bridal market, longing for something unique and romantic, that will not only be treasured, but be worn time and time again, unlike the dreamiest of bridal gowns, made for a one-time occasion. Wherever the brand ventures, I am sure Rosie’s free-spirited endorsers will follow. Sleep under the stars in style in a one-of-a-kind statement sleeping bag. Sleeping Beauties is the brainchild of fashion designer Leah Nicholls, set up in 2016 and inspired by her love of the beautiful Devonshire countryside where she grew up, teamed with the eclectic prints of the catwalks. Leah has created a unique range of 100% cotton, machine washable sleeping bags in an array of vibrant prints and dreamy colourways. I meet Leah on a sunny afternoon to chat about her ethos behind the business, where she finds inspiration for her designs and whether she could ever tire of globe-trotting, in search of the zeitgeist of the modern festival. Sleeping under the stars feels even more magical when you're doing it in a beautiful artisan sleeping bag! This is the philosophy behind Leah Nicholls self-made brand ‘Sleeping Beauties’. Leah’s statement sleeping bags embody all there is to love about the great outdoors, with the addition of a unique stylish print, both inside and out. Inspired by her love of festivals and global backpacking jaunts, founder and director, Leah Nicholls, tapped into the glamping market, setting out to design a more luxurious camping product. “Many of the high street nylon sleeping bags are either left at festivals or stored away and forgotten about. A Sleeping Beauties sleeping bag can also be used as a throw for your bed or sofa, or as guest bedding. They are far too pretty to be kept hidden away,” she says of her creations. Leah grew up on the edge of Dartmoor, South Devon, surrounded by the rural countryside, something she is certain influenced her love for outdoor adventure. A former designer for the UK high street as well as international brands, Leah is no stranger to ever changing fashion trends. “From working as a high street fashion designer for 10 years, for brands such as ASOS, Next and Miss Selfridge, I wanted to eliminate the ‘throw away fashion’ concept by creating something truly unique, an artisan made product that has longevity and will be treasured,” she says. Leah's luxe sleeping bags come in six gorgeous colourways. Leah’s vibrant collection consists of six original prints with each bag telling a different story. My personal favourites from the range included Geo Dreaming; a pretty palette of soft pastel hues inspired by the blue sea and white sands of the coast of Ibiza and Indian Tapestry; a vibrant print of hot orange, teals and sun burnt reds inspired by the dancing until dawn at festivals. Each sleeping bag is unique in terms of style and pattern, boasting special features such as a concealed inner pocket for your phone or keys, with tassels and pom pom zip pullers. Each bag also comes with a matching pillowcase and eye mask. June 2017 will see the brand launching their long awaited double sleeping bag design that can be unzipped to become two singles. Beautifully crafted, Sleeping Beauties make for the perfect accessory, both practical and stylish, that can be used time and again. The beatiful Sari print double sleeping bag. Whether you find yourself sleeping in a tent, yurt, hut, villa, cabin, tipi, tree house, or even in your own back garden, Sleeping Beauties present the ultimate sleeping bag, allowing you to experience the great outdoors without sacrificing style or luxury. The artisan sleeping bags tap into the current on-trend glamping market perfectly - they're unique, eye-catching and beautifully crafted. You won't find anything like this on the high street, so next time you decide to embark on an outdoor adventure, be sure to invest in one of Leah's beautiful bags, rest assured that you will use it time and again, not only on your travels but in your home as well.